Revelation 6:5-7 goes, "When the Lamb opened the third seal, I heard the third living creature say, 'Come!' I looked, and there before me was a black horse! Its rider was holding a pair of scales in his hand. Then I heard what sounded like a voice among the four living creatures, saying, 'A quart of wheat for a day's wages, and three quarts of barley for a day's wages, and do not damage the oil and the wine!'" BUT...does it SPECIFICALLY say ANYTHING about a single currency? Not that I can recall. I have been able to read some more by going backwards! - don't ask! Anyone would tell you, I am nothing but 'trying' :) I shan't give up after agreeing to try again. I was detoured by my book on 'Dispy'. 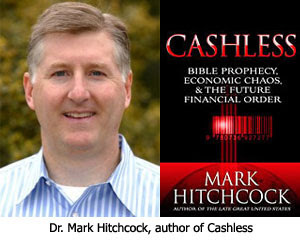 I'd like to remind everyone that the mark of the beast is not just monetary in nature. It's also (dare I say "foremost"?) a means of swearing allegiance to the A.C. Therefore, it seems to me that it can't be as simple as just a world-wide currency. There's something else that goes with it. Otherwise, many people could be tricked into agreeing to taking the mark for survival alone --and condemned to hell. Additionally, in that same fear-factor, there's also the potential promise of the chip creating the precursor to the 'convergence', a digital 'collective [Borg] mind link', --being one with ol' AC hisssself, so they could actually sense & see where you are.